Merger and acquisition deals play a big part in the corporate financing world. Ideally, M&A processes result in creating a company that is both larger and more efficient than the two that have been operating on the market previously. M&A activity on the European market picked up pace compared to the years of the global recession. 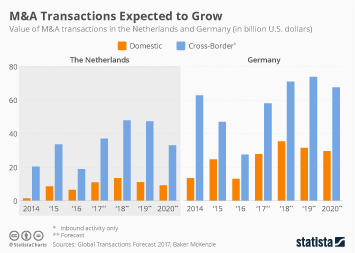 The value of mergers and acquisitions deals on the European market reached 929.3 billion U.S. dollars in 2017, which marked a slight increase in comparison to 2016, but still a notable decline compared to 2007. In terms of outbound and inbound merger and acquisition activity for various European countries, the United Kingdom was the leader on the market in the first half of 2018, with 484 outbound deals and 456 inbound deals. Sector-wise, the majority of European M&A deals targeted companies operating in industrials and chemicals (15.9 percent of the market), closely followed by consumer and energy, mining and utilities. The process of merging two companies together or acquiring a different company is typically executed in a multi-step fashion. Therefore, such deals are usually managed by leading financial advisory companies. On the European market, Goldman Sachs was the leading financial advisor for M&A transactions, with 409.43 billion U.S. dollars in deal value in 2017. Legal advisors also play an important role in the M&A process. As of 2017, Clifford Chance was ranked as the leading legal advisor firm for M&A transactions in the United Kingdom, consulting on deals with an aggregate value of approximately 39.16 billion British pounds. On the Central and Eastern European market, the number of merger and acquisition deals reached 2,113 in 2017, which marked a slight increase compared to the previous year. When looking closely at sectors, the real estate and construction industries noted the highest levels of activity, with 390 successful deals, followed by manufacturing with 308 deals in 2017. The largest deal noted on that market in 2017 was the acquisition of the Russian company Rosneft, for over 7.5 billion euros.